One of the biggest chores in the backcountry is hanging your food in the trees so bears won’t get to it. It is very time consuming. 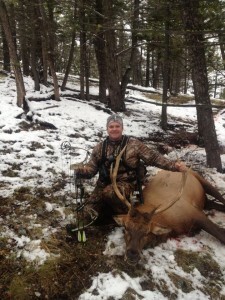 Not any longer, thanks to the Bear Shock® Food Storage Electric Fence for the backcountry. Nothing says Montana like a backcountry camping experience! But while you are out enjoying the Big Sky Country, please be BEAR AWARE! Being bear-friendly in Montana is something that we pride ourselves on. And it does come with sacrifice—the welfare of the bear always come first even if it means that we won’t be able to see a bear or get that perfect picture. 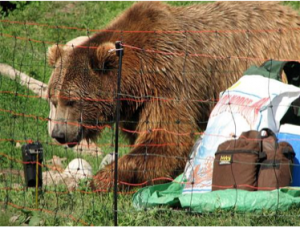 It means taking steps to prevent bears from finding sources of food on your property or when you are out camping like using our Bear Shock® Food Storage Electric Fence. Did you know that once a bear is food-trained, it is often impossible to un-train them. That is why biologists so often say a fed bear is a dead bear. So let’s don’t feed the bears! Your attentiveness in keeping your outdoor camp space “Bear Friendly” is doing your part to keep Montana’s grizzly and black bears wild and free. The American black bear is the smallest of the three bears types that can be located in North America, and are it should be noted that they are only found in North America. Black bears have the ability to climb trees because of their short non-retractable claws. Black bears are very easy going and have a variety of habitat types, they are mostly found in forested areas with thick ground vegetation and an abundance of fruits, nuts, and vegetation. In the northern areas, they can be found in the tundra, and they will sometimes forage in fields or meadows. 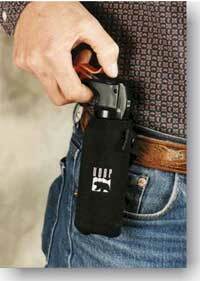 Black bears are inclined to be solitary animals, with the exclusion of mamma black bears and her cubs. Typically, these bears will forage alone, but will endure each other and forage in groups if there is a wealth of food in one location. Most black bears hibernate subject to local weather trends and the availability of food throughout the winter months. In areas where there is a reliable food supply and warmer weather all winter long, bears may not hibernate at all or do so for short period of time. Female black bears will give birth and stay denned throughout the winter, but you should know that both males and females who do not have young may leave their dens from time to time during winter months. 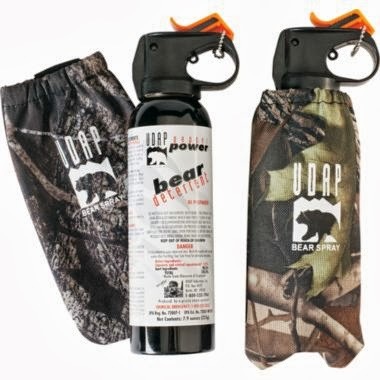 With everyone heading to the mountains to get that last hike in before the snow flies, don’t forget your UDAP Bear Spray! 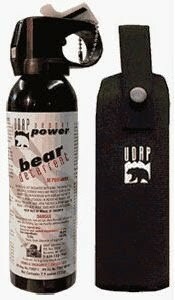 UDAP Bear Spray works on all kinds of animals including moose, not just bears! Read what one of our customers had to say! 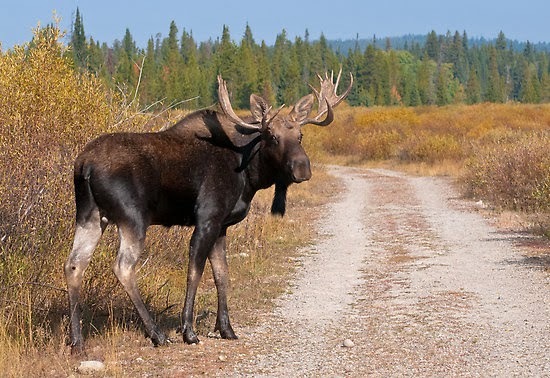 You just never know how a moose will react…. Last year I was working near the Continental Divide just south of Glacier National Park. Over the course of about two months I saw this cow moose, never saw a calf, at least a half a dozen times, in the same area. I came with-in a hundred yards of her each time and she never displayed any aggression. Then one morning I’m in the same area and see the cow moose again. This time, at about a hundred yards or so, she lays her ears back, with the hair standing up on the back of her neck, and trots in my direction. I thought, “what the hell’s up with her?” and stepped back in the timber behind the largest tree I could find. She came charging in, reared and started striking with her front feet around either side of the tree. I’m ducking and dodging and thinking this old girl is pretty serious. 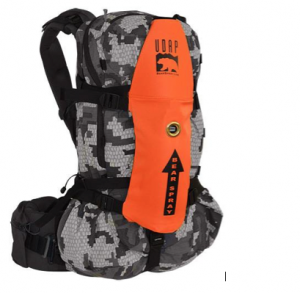 So enjoy your hike before the snow falls, take some great photos and don’t forget your UDAP Bear Spray!